:In Choose and Choose Again, the reader will encounter story after story of different people, most of whom are from Hope Community Church of Detroit, where Pastor Butcher has been sharing the healing love of God for thirteen years. They represent men and women, African American, Caucasian, Latino, and Asian, urban and suburban, professional types and prostitutes, clergy and addicts, drunks and lawyers and convicts?wounded human beings who have found themselves empty, dying, and longing to be filled. The stories are not only about their own healing and restoration but also about how the love of God heals. Butcher hopes that readers will find before them a path of healing that they feel compelled to embrace. He begins with his own story of emptiness and despair, and his journey to healing, but the ultimate power of his message is that this healing journey is for anyone who is willing to own his or her emptiness and hold one's heart out to God, who is desperately longing to love each person all the way home. 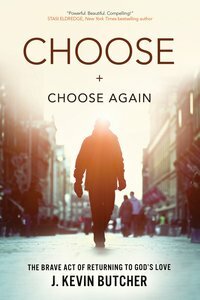 About "Choose and Choose Again"